It’s a term that is becoming more and more prevalent in mainstream media, so the question is “What is eSports”? Most people know it has something to do with online videos games but let’s take a deeper look at the esports industry. An eSport is a competitive tournament of video games played by professional gamers. Tournaments and events are hosted around the world or online where players (gamers) compete in selected games for prize money or similar awards. Games are head to head in nature usually with teams representing each side playing in matches that can be single elimination, best out of 3 or best of 5. Esports started to become absolutely HUGE around late 2014 and early 2015 lead by top games League of Legends, Smite and DOTA2. Millions of Dollars in prizes are given away in Championships every year and actual sporting arenas like LA’s Staples Center, New York’s Madison Square Garden, Seattle’s KeyArena and the 40,000-seat World Cup Stadium in Seoul Korea sell out for fans just wanting to sit and watch these games on the big screen. In 2015, is was estimated that 134 Million people throughout the world watch eSports and the League of Legends World Championship had more viewers (27 Million) than the NBA and MLB World Series combined. That is quite a shocking stat to many that viewers for video game players are crushing major sporting events in North America. Esports games are made up of various categories of video games: First-person shooters games (FPS), Multiplayer Online Battle Arena games (MOBA), Real-Time Strategy games (RTS) and Fighting games. For more details about each game see our Top Esports Games article. Why Do People Follow Esports? Some people are big into Daily Fantasy eSports (DFES). Top sites like AlphaDraft and Vulcun allow fans to play for real cash prizes by creating fantasy teams of players and creating a team that allows them to compete in head to head contests or in large tournaments for thousands of dollars. 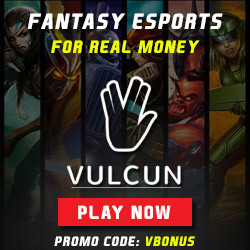 Also at Vulcun not only can you play fantasy eSports for real cash prizes but players can also win skins, mods or weapons for their own gaming needs. Another popular way to get into esports is by laying a few bucks down on the live action. Betting on eSports is growing by enormous amounts in Asia and Europe and has slowly made its way into North America. In the next few years expect esports betting to gain significant ground on other niche markets and even become mainstream. Finally, gamers love the games and love watching the pros play them at the highest level. You can learn a lot by watching more skillful players and even start to apply some of their techniques to your own gaming abilities. The beauty of eSports is that people all have different reasons for following and let’s face it we all stay kids at heart and most of us grew up playing some form of video game. This is becoming a controversial topic being debated amongst many in the industry. In the literal sense, no it is not a sport. But when you factor in that players compete in high-stress situations, can suffer injuries and have major sponsors and networks sinking big money into them…it starts to sound a lot like a sport after all. How much money do these “Athletes” make? The top eSports teams make their main income from sponsorships. These sponsors are usually energy drinks and computer parts companies but have expanded into some big names also like: Red Bull, Coke, Sony, Nissan, Microsoft, Alienware, Stride Gum, Dr. Pepper and Doritos just to name a few. The logos of the sponsors are on jerseys and players wear them while streaming their practice sessions for fans to watch on Twitch or their own YouTube Channels. Some also have their own shows with logos promoted throughout the broadcasts. The top teams also will compete in large worldwide esports tournaments with total prize money in the tens of millions of dollars. On top of that teams get donations from fans all over the world to help keep the teams afloat.